Introducing the super elastic, super flexible signal stick antenna -- From SignalStuff. They are made of Nitinol, which nearly indestructible and non-kinking. Nitinol is the same material used in muscle wire, as it retains its original shape no matter what happens. They are so flexible, we ship them in rolled up. These antennas feature a male SMA connector, making it the perfect addition to your HamShield. More importantly, a portion of each sale goes to support HamStudy.org, a free website to help you study for your ham license. Each Super-Elastic Signal Stick comes backed with a lifetime warranty, with free return labels for those shipping within the United States. We have two variants: 220 MHz 1/4 wave and 144/440 dual band. Note: You might want to add a right angle SMA connector to your order if you want to set the Arduino on a table and have the antenna facing up. 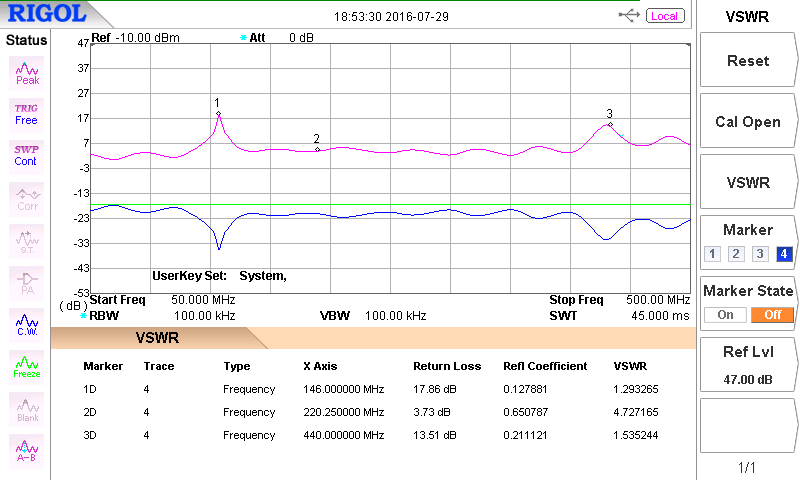 This SWR chart was taken using a balun to isolate the antenna and a ~18″ tiger tail to stabilize the SWR. Take it with a grain of salt, but it’s fairly accurate as far as it goes. Extremely light-weight — reduces connector strain on your radio!